HONG KONG -- China has earned a reputation as the world's fastest-growing renewable energy market, but its offshore wind power program appears to be an exception. Turbines near Hainan province are spinning, but China's overall progress in offshore wind farms underwhelms planners. Photo by Xiong Yijun, courtesy of AP Images. Industry players say several Chinese offshore wind projects were not included in the statement, but adding them up still can't close the large gap between the set target and actual installations. "It is widely expected that China will not be able to meet its offshore wind power installation target for 2015," said Shane Sun, who leads the Asia-Pacific team at the Shanghai office of the market research firm Make Consulting. That will make the offshore wind power sector fall into a small group in which renewable energy developers fail to achieve their 2015 goal. By contrast, government data show, the installation of wind turbines on land shot past its target a long time ago. 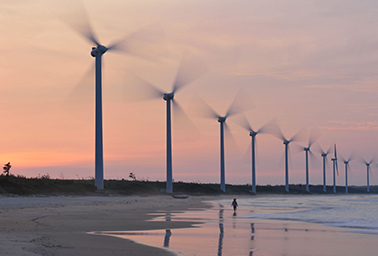 The slow progress in offshore wind power development is bad news to Chinese coastal cities. Shanghai, for one, suffered from record air pollution last year, partly because of burning coal for electricity. Policymakers there hope wind turbines installed along its coast could help feed more clean energy into the city's power grids. The turbine-making industry also views the Chinese offshore wind sector as a new gold mine. Offshore wind resources are estimated to be three times greater than those of wind on land. And engineers hope installing wind turbines just outside the country's energy-guzzling coastal cities can save a considerable amount of money and trouble. The resource is very close by, compared with building thousands of miles of transmission lines to bring electricity from more wind-rich inland areas. But despite what appears to be great promise, there is one almost unbeatable enemy standing in the way: the financing. As Marius Korsnes, a researcher specializing in China's wind power at the Norwegian University of Science and Technology, put it: "Many of the developers don't want to develop projects that they will lose a lot of money on." To encourage companies to compete with each other and eventually drive down the cost of developing offshore wind power, China used to rely on a bidding system to decide who would get government permission for building new projects. The bidding system worked well to reduce costs -- probably too well. Korsnes said in some cases, offshore wind project developers would bid with unreasonably low prices in order to win the desired resources yet suspend their project construction to avoid a financial loss. Although the Chinese central government last year introduced a new pricing mechanism that pays developers 12 cents per kilowatt-hour for intertidal wind farms and 13 cents per kWh for near-shore projects, this price is still considered too low to be economically attractive, Korsnes said. Worse yet, renewable energy projects in China -- like elsewhere -- are running on government subsidies. However, the country's wind and solar developers often have to wait a long time until the funds arrive. "In a good case, project developers will have to wait for six to 12 months," said Sun of Make Consulting. "That waiting period is actually often much longer, stretching to more than a year." That much delay could eat into cash flow at companies, Sun said. He added that since the cost of constructing, operating and maintaining wind turbines at sea is more than double that of wind farms built on land, Chinese offshore wind developers have a harder time dealing with the delayed payment. Difficulties in developing offshore wind projects in China go beyond the economic issue. The long list of challenges also includes a shortage of skillful installers and the lack of high-quality wind turbines capable of operating at sea, said Cyril Cassisa, a China-focused energy expert with consulting company Enerdata. Cassisa explained that although Chinese companies have already led the world in onshore wind turbine manufacturing and installation, they still lack technical know-how for planting reliable wind farms in the far more hostile environment at sea. The much-needed research and development efforts are considered more efficient outside China, and existing Western offshore wind technologies can also better withstand rougher weather and the omnipresent erosion from sea salt, Cassisa said. "To develop offshore wind and get to the target, China probably should rely on foreign technologies," he added. But some experts doubt whether Beijing will be willing to do so. For years, Chinese leaders have used the domestic market as a test bed to mature home-grown technologies, and there is a hope that such practice could turn the country into a global leader in yet another renewable energy segment, just like what happened with solar and onshore wind. Experts say all of these not only have made China's offshore wind expansion fall far behind its 2015 target, but also will lead to a revision of the planned installation in 2020. Under a plan presented by the National Energy Administration in 2011, China targets offshore wind power capacity of 30 GW by 2020. Sun said earlier this year that some government officials have suggested lowering that target to 12 GW. Although the figure has yet to be finalized, "the cut is supposed to be big," Sun said. Can floating wind get Calif. to carbon neutral?